As in ballistic missile submarines. As a test platform, the Gorae is unlikely to see much operational use except under desperate circumstances. North Korea will need to build multiple improved Sinpo-C submarines if it wishes to possess a credible and survivable sea-based nuclear deterrence. However, such deterrence is highly valued as submarine delivery systems make it difficult for foreign adversaries to have confidence they can wipe out nuclear-retaliation capability with a first strike. That’s why it’s unsurprising that North Korea is quietly proceeding with the development of the Sinpo-C and Pukkuksong-3 despite ambiguous promises to denuclearize. In the summer of 2018 a flurry of reports confirmed that North Korea has continued construction of a second ballistic-missile submarine, designated the Sinpo-C by intelligence analysts after the shipyard in eastern North Korea. South Korean representative Kim Hack-yong told the Wall Street Journal that South Korean intelligence officials had reported activity and new materials around the construction site of the submarine. For context, Kim is a member of a conservative party which is skeptical of President Moon Jae-in’s diplomatic outreach to Pyongyang. The Sinpo-C is estimated to displace more than 2,000 tons and have a beam of 11 meters, making it the largest vessel in the Korean People’s Navy. The KPN operates roughly 70 submarines, technically giving it one of the largest submarine fleets on the planet—but most of the submarines are very small types incapable of sailing far from the Korean Peninsula. The existence of the new submarine had first been publicized in October 2017 by Ankit Panda of the The Diplomat based on U.S. military intelligence reports passed on by government sources. Then in November the website 38North published detailed satellite photos showing new construction and testing activity at Sinpo, including 7-meter diameter components which may be segments of the pressure hull. Multiple submarine ejections tests were observed earlier that year, including a failed launch in September that reportedly killed one Korean according to Japanese newspaper Asahi Simbun. Then in 2018, a launch tube likely for a new type of Pukkuksong Submarine Launched Ballistic Missile (SLBM) was seen installed on a test facility. This is only the latest report confirming the unsurprising reality that North Korea is covertly proceeding with the development of nuclear warheads and delivery systems despite vague promises made at the summit between President Donald Trump and Kim Jong-un to denuclearize. For example, late in June five intelligence agents told NBC in June that North Korea is actually accelerating its production of enriched uranium, while seeking to conceal the extent of its program. The nuclear weapons, and the rocket technology to deliver them, are extremely expensive investments by Pyongyang, and the Kim dynasty is unlikely to give them up entirely because they are seen as guarantors against a U.S. attack. The new submarine would be a successor to the Gorae (“Whale”) or Sinpo-B, first identified from satellite photos in 2014. The 1,700-ton submarine is believed to have been inspired by the older Soviet Golf-class submarine, several of which were transferred to North Korea for scrapping. The 68-meter long vessel is thought to be intended primarily for testing rather than operational deployment. A launch tube is visible in the Gorae’s sale (or conning tower). This configuration makes it easier to fit in vertically launched ballistic missiles without having to build a larger hull, but limits the payload to just a few missiles—or even just one. A crew photo released by North Korea implies a complement of seventy to eighty personnel. 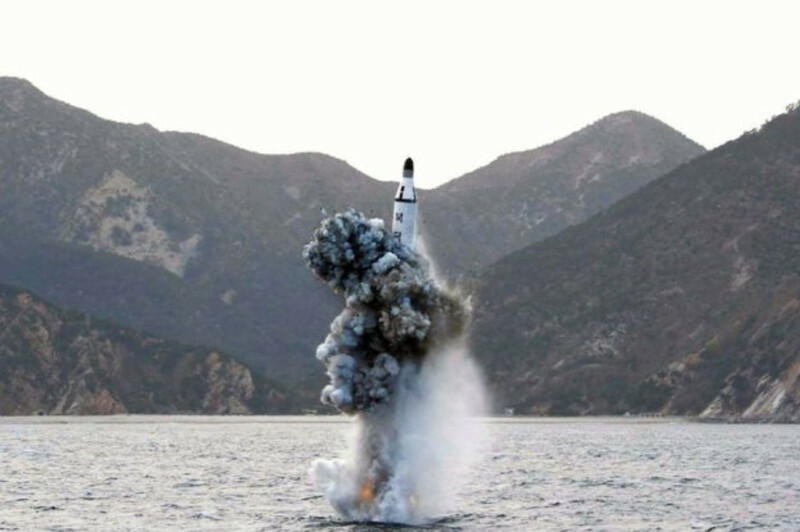 More challenging to develop than the submarine itself would be its Pukkuksong-1 (or KN-11) submarine-launched ballistic missiles (SLBM), which can be fired from underwater (see this photo). The name itself means “North Star” or “Polaris,” which probably-not-coincidentally happens to be the name of the United States’ first operational SLBM. A special raft was even built to test launch the SLBM, and multiple test firings were observed. Experts estimate that the 9-meter long missile, painted white with snubby black tips, can strike targets up to 750 miles away, and would surely be armed with a nuclear warhead. There’s even a photo of Kim Jong-un observing a Pukkuksong launch. Though North Korea initially tested a liquid-fuel rocket apparently inspired by the Soviet R-27 SLBM, the Pukkuksong-I ended up being a two-stage solid-fuel rocket. Though heavier, solid fuel rockets can be fired on very short notice compared to liquid fuel rockets which need to be gassed up prior to launch (the fuel can’t be left in the tanks as it is highly corrosive) and pose major safety hazards—traits that place their survivability versus a first strike in question. However, designing solid fuel rockets is technically very challenging as the fuel must be built into the casing and air bubbles, warps and cracks can easily lead to catastrophic failures. In fact, the Pukkuksong-1 was considered such a breakthrough on this front that a land-based Pukkuksong-2 variant was developed. 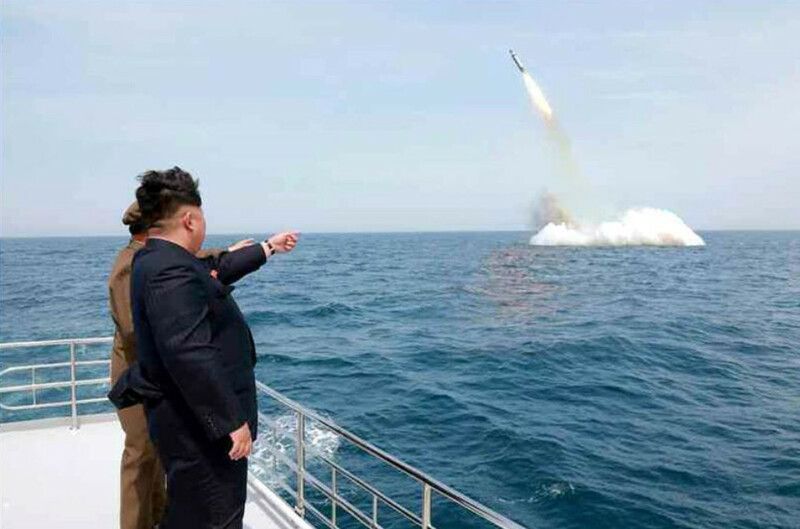 The reports of a new Sinpo-class submarine coincided with suggestive photos released by North Korea of an inspection by Kim Jong-un. One photo has a display to the right detailing plans for a succeeding Pukkuksong-3 missile. Another shows off a rocket which appears to have an advanced wound-filament casing. In general, expert speculate the Pukkuksong-3 would be a lighter rocket due to use of composite materials, allowing for greater striking range. These background revelations were surely intentional, and could be deceitful. In fact, this degree of exposure is a feature rather than bug from the point of view of Pyongyang, which wants Washington and Seoul to know it has SLBM capability to deter from being attacked in a first place. After all, actually launching nukes would only likely occur in a scenario where the regime would likely not be long for the world. It’s important not to exaggerate the capabilities of the Gorae and its successor, however. These submarines and their missiles possess limited range and speed, and would surely prove fairly noisy compared to Russian or American submarines. Lacking air-independent or nuclear propulsion, they would need to snorkel or surface every few days to recharge their batteries, exposing themselves to detection. At best, they could attempt to sail out a modest distance to enter within striking range of Australia or Hawaii, though at great risk of being hunted down by patrol planes, surface warships and submarines of Japan, South Korea and the United States. On short patrols around the rocky, shallow waters of the Korean Peninsula, however, the Gorae could prove more difficult to track. It’s most threatening tactic would be launching a missile attack on South Korea or Japan from an unexpected direction. For example, U.S. THAAD anti-ballistic missile batteries are deployed to intercept attacks from the north, but not from other vectors.